Painter Carroll Swayze has a long and accomplished history as a successful artist and leader in the arts community. As an experiment, she studied the realities of running her small business. We spoke about her experience and the amazing results. Artist Carroll Swayze peeks out above a collage of her work. AS: What inspired you to take a hard look at your business? CS: There comes a time in everyone’s life where a person has to be realistic about their choices. I have always been a printmaker and a painter, creating original art in my studio every day. I have always been easily supported by individuals who buy original art because they feel that handmade art and the artists who create it are important to everyday life. I could travel anywhere and always find my patrons and I thought that concept would last forever. But I was wrong. Unfortunately for art show artists, the American economy is changing and so is the art show venue that we have counted on our entire lives. Demographics are changing, life is expensive, the clientele we have always depended on is getting older and buying less, and the young art lover wants to go to “art parties” and make their own paintings. Add to that the inexpensive machines to make instant posters of original art (color copies, offset reproductions, giclees) and our incomes have been virtually crushed by it all. It was time for me to take a good hard look at what I was doing and try to figure out how to survive in this unstable economy. The first thing I did was to sit down and to figure out where my money came from and where it was going. In 2011, I was doing 20-23 art festivals a year. It was a show schedule that was too big to handle as an artist who creates only original art, and very hard on anyone in their late 50’s. I work completely alone; no assistants, no employees. Everything is done by my hand alone. With the schedule I had, I worked about 10 hours a day when I was home and did everything from scheduling shows, creating new plates, printing those plates, painting the etchings, painting originals on paper, matting, cutting glass and building frames. I also am very active in my community in the local art scene and have a big family life with three sons and four grandkids. I have more energy than almost anyone I know, but I was tired. I decided to figure out exactly where my money came from, what it cost me to live and what it cost me to do shows. My income research was telltale. I looked over my bank statements and then I looked over my art “to do” notes and realized that not only did I make a lot of money locally in small shows around town and in my studio, but I also had over 30 local commission possibilities that year alone. I had overlooked and ignored them because I was so busy travelling to do shows out of town. I’ve lived in the same small tourist town my entire adult life, on the same property. I am virtually famous in my own home town, yet I had chosen to ignore this in my business life. This was easy money, local people who had come to me that I had passed by. I could skip a show and do a commission with no show fees or travel expenses. In the long run it was like making twice the money for half the effort. I was shocked! What an enormous waste of resources! This was the most important thing that I have ever done for my business. It was astounding what I was spending to make what I thought was a living. I figured out to the penny exactly what it cost me to live every month and then I figured out what it cost me to do shows, adding anything that had to do with doing shows – such as show fees, jury fees, vehicle and gas expenses connected to shows, hotel bills, camping bills, dinners out, dinners in, tolls, business percentage of vehicle insurance, materials and supplies to make and frame the work I sold at shows, etc. I did not include the mortgage for my home and anything I spent when I wasn’t traveling doing shows. This was just everything I spent to do art shows. I couldn’t believe it when I finally arrived at my cost of doing shows: a whopping $2,657.00/month! I was astounded. My cost of doing shows was $31,884.00/year! Remember, I have to make $31,884.00 BEFORE I make a penny of profit. Wow! What it meant was that if I stayed home and didn’t do any shows and only sold work out of my studio, I could cut $2,657.00 out of my monthly expenses. It was time to find a new business plan. AS: What steps did you make to increase your profits and change your life? After my startling discovery, I realized I had to change the way I lived and worked. I had to change the way I thought of shows and I had to change the way I thought of my customers, patrons and collectors. I adopted the catch phrase: “Less Shows, More Money” and went about making that happen. The first thing I did was to sit down and actually figure out who buys my work, not the demographic that I think buys my work or the demographic that I want to buy my work, but the actual group of people who buys my work. Most of us think we know our clientele, but very often we are wrong. I spent the next six months watching carefully who was attracted to my work, who walked into my booth at shows and who wrote the checks or handed me the credit card. I thought my buyer was a 30-50 year old hip, educated woman. I was totally wrong. My actual clientele was a 50-70 year old retired, independent, married man. An educated outdoorsman, who enjoyed adventure and the finer things in life, laughed often and was dedicated to having fun with his family until the day he died. That was my real clientele, and I went about finding out where that man lived or went on vacation. I researched shows where that group of people might actually live. Then I chose which shows I was applying to, very carefully. I did a cost analysis of each and every show, figuring out exactly what each show cost me to do. Then I compared it to the demographic that buys my work and lives in that area. The next thing I did was to change the way I did shows completely. I started with the number of shows that I was doing and decided to do only 15 shows per year. I stopped doing shows because I liked them. I stopped doing shows because my artist friends would be there and I’d have fun. I stopped doing shows because I thought I might have a chance of making money in that town and was willing to roll the dice and gamble. I stopped doing shows because other artists told me they were good. I stopped doing huge shows with huge crowds and huge expenses. I don’t need thousands of strolling people walking by my booth to make a living; I only need a few interested buyers. In fact, if you really think about it, each of us can only create a limited number of original pieces of art, so we really only need that many people to buy them to give us a nice profit and a good living. Instead of blindly applying to shows, I spent about two weeks researching shows and their communities trying to figure out if my people lived there. I chose smaller, less expensive shows in areas where my clientele lived and vacationed. I stayed closer to home more and sold more to my loyal local followers. I’ll give you an example from this past weekend. I chose to participate in a local fundraiser for our YMCA children’s programs instead of driving two hours to do a well known Florida show that I used to do. When I did the show last year, I sold $2,800.00 worth of work. After subtracting the cost of the show fee, hotel, gas and materials, my profit from that show was $1,350.00 and I was out of town for three days without access to those people ever again. By comparison, the fundraiser was a much more appealing and fiscally profitable experience. I exhibited ten original paintings, of which I sold seven. Someone else set the display up and took care of the sales. I stayed for free in a beautiful resort on the beach for three days. I was given free tickets to this incredible event, met hundreds of new local possible customers and reconnected with hundreds of patrons that I hadn’t seen in years because I was always away at shows. I donated a small part of my sales, which gives me incredible publicity and good feelings in my community and I made a profit of $3,200.00. I have already had two calls from people who want to come to my studio to buy this week, so my profit will continue to climb and I’m very happy with the choice I made to stay close to home and try something new. There is a mystique surrounding artists, and I used my reputation in town to bring new customers to my studio. I started teaching in my studio once a week to bring new people directly to me, and I started having art & music events on my property. I had cooking contests with art prizes at those events, so my customers even brought the food for the party, which brought the costs down to almost nothing. I do my own press instead of waiting for the reporters to come to me. If you learn the correct way to write a press release and how to submit it to them in the right form, the papers love you. Always include a picture and they will almost always print it. For free! I watch what’s going on in my area and create things to do that will catch the eye of the press. The key is to do a little research, find out who the editor and the reporters are in your papers, make sure you meet them and spend some quality time with them. Then the key is to learn to write an interesting informative narrative that gets their attention. I am generally in the paper with a picture at least every 2-3 weeks. The reporters love it because by giving them a finished article, you have literally done a week’s worth of work for them. For the past four years I have changed everything about the way I do business, from what shows I do, to how I deal with the community I live in. My show list has changed drastically. Last year I only did 14 shows. I’m making more money because I know who I sell my work to and I go there. I get to spend a lot more time with my family, and I am actually saving some money. I have spent two months in Europe, a month in the Caymans, and a couple weeks in the Bahamas. I took a month long driving trip down the Pacific Coast Highway from Vancouver to Los Angeles this past fall, and I’m writing an art column for the local paper every two weeks which has always been a dream. I made a business plan that only another independent artist could understand, and then I went to work. Thinking outside the box enabled me to change the way I do shows and broadened my horizon giving me more time to paint and create art. It was extremely hard to change the way I had done things my whole life. But it’s truly the best thing I ever did for myself because I am thriving, and I’m doing it my way with the same fantastic free lifestyle that I am accustomed to. It won’t be the same for everyone because we all have different situations, but I know we can all survive this economic glitch and live to laugh, make art and continue the adventure! Excellent read. Thank you for the insight Carroll! As a lifelong artist who finally took the plunge to go full time recently, your interview is very informative and gives me faith in my drive and my community and being a successful artist without becoming burned out. Will, I have been after Carroll for two years to get this interview. She wrote a brilliant article for NAIA on this topic and it was so incredibly insightful – for all artists. Very pleased to publish this today! Down to earth and timely. Thank you both for sharing. As a studio artist I have wondered about how it must be like to sell art in the art fairs. I realize that I personally don’t like to go to shows or fairs because if I am looking at art, I want to focus on what I am looking at. Large crowded places simply exhaust me. Now after reading this article I am so happy that I have stuck to my studio and channeled my focus on people and collectors I meet in person as well as the social media. I am also finding out that internet sales are the best bet for me. The people who connect with my art are also perhaps shy introverts like myself who know what they like, have an easier time finding the artists they like by seeing their work on Featured Artists blogs (like Artsy Shark or Art & Art Deadlines) and social medias like facebook right from the comfort of their homes. Thank you for sharing this as I can go ahead and cross out this option of doing the art fairs and instead focus my marketing efforts where it really works. Great ideas and conclusions Carroll!! Thanks for sharing your experience! I’ve been working on streamlining my business in the last year – and I’m excited to hear I’m on the right track! Take Care! Your art is gorgeous! Thanks for the great insights! I passed on the link to the two groups I work with as many of them do festivals and have voiced how tough the circuits have become (as a financial and time drain). I think we often overlook our local resources and support, especially as so many of us have transitioned to an online presence thinking that we have the whole world at our fingertips. But, there is nothing that can replace the personal relationships that can spring from local communities. And, thanks for breaking down the financials as that really helped clarify your thinking and decision making. This doesn’t need to be a reality! It is 100% possible to have ongoing access: stay in touch with a simple tried and true marketing effort using the always popular and highly effective tool called Permission Based Marketing with Emails. With a 97% delivery rate – we all can keep ourselves in front of our fans. Those buyers and the excited prospects from that show are wondering where you are, Carroll. 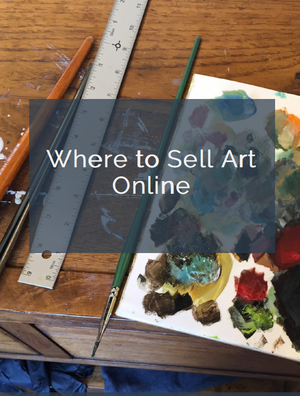 The buyers are very likely to buy again if they saw your fabulous work in their in-boxes! And the “lookie-loos” will eventually succumb, too. LOL. You love doing less travel, so don’t let the opportunity to have almost passive income in your life without even leaving your computer. An email once a month to your “audience” of buyers and prospects would surely increase your bottom line and attendance at your now very selective art fairs, too! When the day comes when you want to do even less shows, emails will be your greatest tool and most cost effective, too. Since you are all about numbers (good for you!) here’s a stat: Emails have an average ROI of over $40 for every dollar spent. Nothing compares. Nothing. What super insights into who “actually” buys your work as opposed to who “might possibly” be your collector. Definitely worth some soul-searching and some invoice and records-keeping practices to track your client base. Well done, and so well-written! What an inspiring article! Your work is wonderful! pure genius. It’s true – my best shows are those that I sleep in my own bed and generally are just one big old day of FUN – as are the commissions I receive at those shows ! Great article . Thanks so much for sharing. I’ve always known it’s about finding and connecting with your clients, and this article is inspiring me to spend more time targeting those customers. Think smart and paint smart! Wonderful insight, thank-you for sharing it with all of us! Now I am not feeling bad about doing the high end shows. I do a couple farmers market shows locally at a nearby park, I always make sales there but now you got me thinking how I can home in on my community more. Hopefully will make more connections with people when I go back into the workforce & work part time outside the house this fall. This was an excellent article. And a real eye opener. Thank you to Carroll Swayze and Artsy Shark. Thank you Carol. You are a rock star in Englewood! You’ve given me a lot to think about as I am a self employed seamstress and quilt maker. I also handle social media for Englewood Animal Rescue. I would like to see your thoughts on using social media as a business tool in future articles.